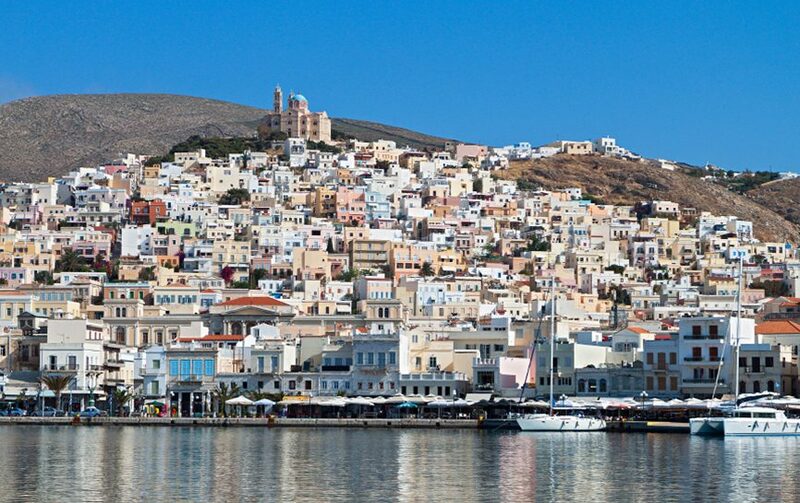 Syros dominates the heart of the Aegean with the dynamic character and the cosmopolitan grace of a queen. As a dominant force centered in Ermoúpoli, the capital of the island and of the Cyclades continues to preserve and enhance the glamour of a bygone era. Sharing a story that unfolds through the winding alleys, the traditional villages that brilliantly orchestrate the medieval with the Cycladic architecture, the Orthodox and Catholic churches, the stunningly beautiful beaches, the azure sea and the magical natural scenery. Just 83 nautical miles from the port of Piraeus and 62 miles from the port of Rafina, Syros Island is one of the most favorite holiday destinations in the Cyclades, ideal for travelers with refined taste. This is the island where Greek tradition and western influence come to a harmonious marriage. Ermoúpoli (meaning “the city of Hermes”) has been the first important trade and industrial centre of the country in the 19th century. Evidence of this glorious past can be seen on public buildings (the City Hall, the Customs Office, “Apollo” theatre), on the neoclassical houses and at the beautiful squares. Due to its economic activity, Ermoúpoli has been called “Manchester of Greece” and the history of its years of blossom is exhibited in the Industrial Museum. The population of roughly 25 thousands residents are Orthodox and Catholics. The capital Ermoúpoli is also called "The Sovereign of Aegean" and it is built in the hills that surround the harbour. You will be charmed immediately by her impressive architecture which is perhaps the uniquely classical city that has remained in Greece. An architecture that has witnessed the history of Syros that began from ancient times and leads to today -A combination of old with the new, classical with the modern. The northern part of the island is named Apano Meria (Above Side) and is mountainous, while the southern part is flat and we find most settlements, villages and beaches of Syros here. Apano Meria with her picturesque views and her calmness calls you to explore her. While streets and paths are minimal you nonetheless lead through a astonishing landscape with rocks, caves, and bridges to the virgin beaches of the island. In contrast the southern part of Syros has excellent roads that connect all the villages as well as with Ermoúpoli. The towns and villages here are well developed tourism sites with modern hotels and organized beaches. Overall, the combination of natural beauty, the culture that it exudes and the hospitality of her residents is unique and will make your vacation in Syros unforgettable.